I posted this in another thread about CR's track event, but think it's a worth a thread of it's own. Engine torque is the amount of static torque that an engine dyno would need in resistance to hold the engine at full throttle, at a specifiic rpm. Eng Hp rates the ability of the engine to do work in a specific amount of time. An example would be spinning a lock-nut on a stud with an air gun set at 50 ft-lbs and 20 rpm. 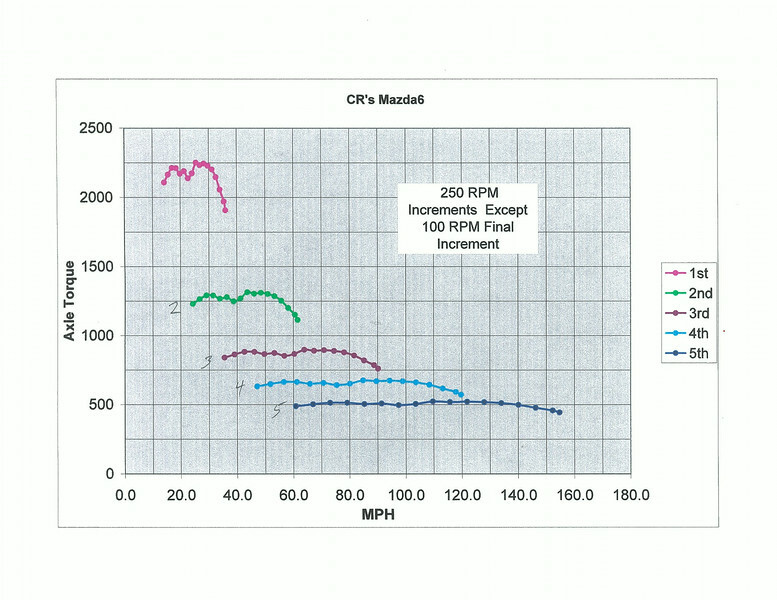 With a conversion factor to change rpm to arc length per minute, you get Ft-Lbs/min, or Hp gun supplied at 20 rpm. The Torque Peak simply is the highest ratio of [Torque / RPM] . 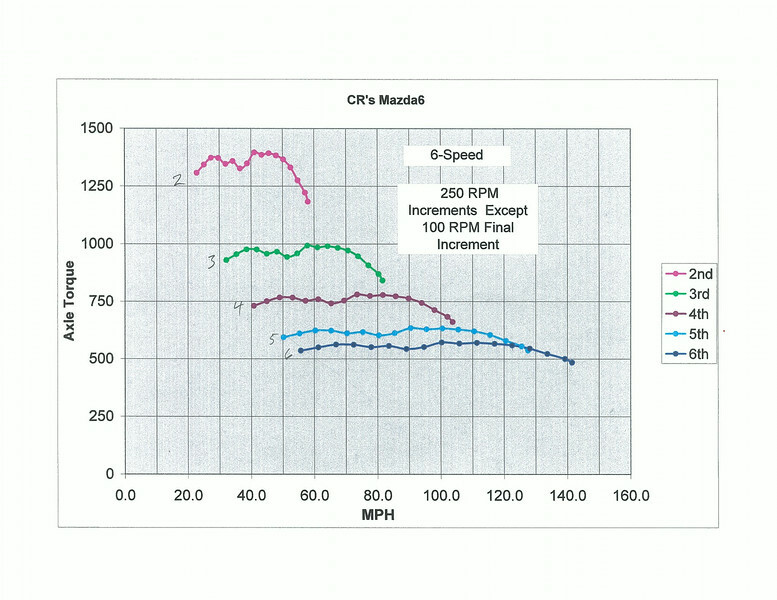 For any gear, the car will accelerate the hardest when at the torque peak, ignoring wind drag. But, in most cases, you can downshift to a lower gear and accelerate even harder, off the torque peak, due to more hp at higher revs, in he lower gear. Years ago, I created an Excel Spreadsheet called "Shift Points". You enter the gear ratios, tire dimensions, and the HP curve from a dyno run, or curves from the auto maker. In this case, it was a dynojet run for the stock 3.0 Mazda 6. The firstcase is the stock 5 speed manual, and the 2nd case is for the 6 speed available in Australia. I put the results on "smug mug" . I know a person that uses shipping containers to ship british parts, and cars, overseas. The way to get a 6 speed would be to find a place that gets your 6 speed into a container in australia, then to the US by container ship, and then to you in the states. Last edited by KevinK2; 08-03-2014 at 05:58 PM. Headed back to VIR in two weeks with better telemetry. I'll be more conscientious about my shifting near red line and share the results.